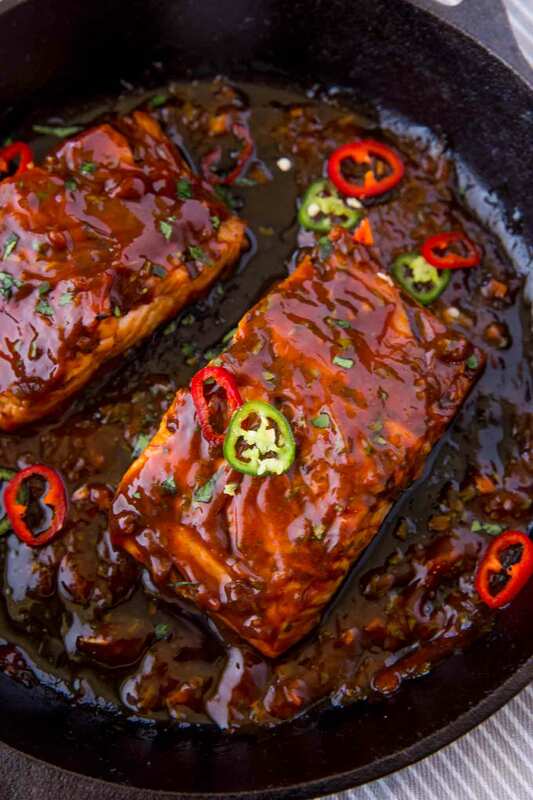 Thai BBQ Salmon cooked in a thick sweet and smoky bbq sauce topped with sliced chili peppers. Full of spicy, sweet and savory flavors for just 2 Weight Watchers Smart Points per serving! 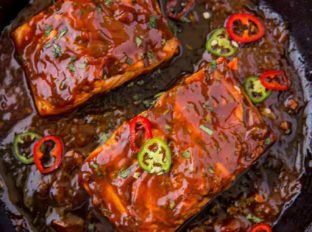 Thai BBQ Salmon with a sweet and spicy bbq sauce that you can make in just seconds. 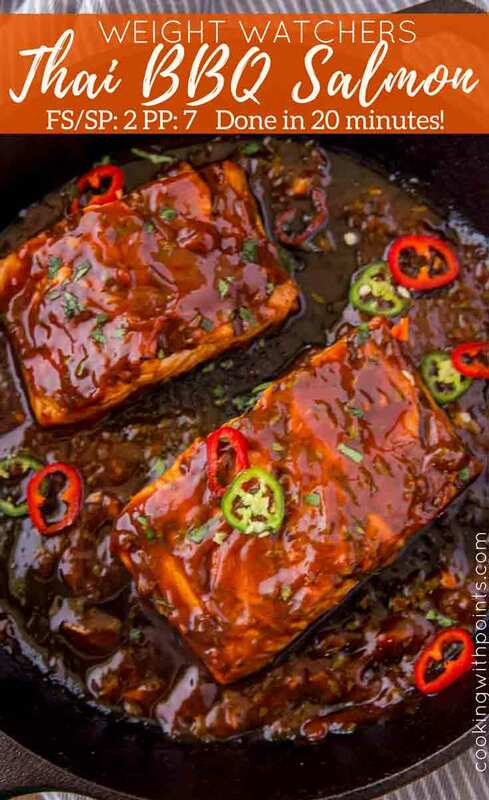 This dish is a breeze to make and only 2 smart points per serving including the bbq sauce! One of my favorite ingredients in the recipe is the Sweet Chili Sauce. I use it to tone down spicy flavors, but I also love using it as a dipping sauce. You know those Cilantro Chicken Wontons from Trader Joe’s all us WW people love? 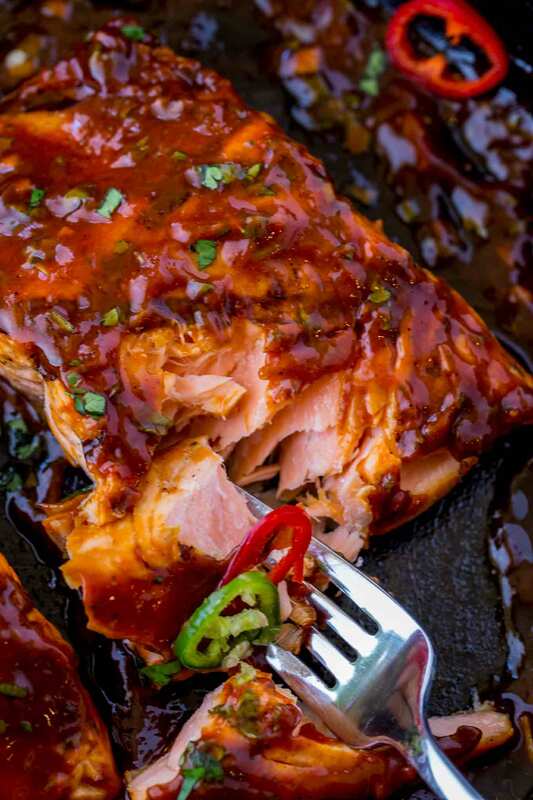 Yeah I dip those in this sauce from this salmon and it is basically heaven on earth! You’re probably curious why I love working with salmon so much on the blog. Well, salmon is a food that offers a lot of value to us and our health. It is rich in Omega-3 Fatty acids, is high in vitamin B and a great source of protein, have high amounts of Potassium and Selenium. Contains antioxidants, can reduce the chance of heart disease and help keep weight down. OH, and it’s 0 smart points per serving. Most people I know were celebrating chicken more than seafood and this was surprising to me because while chicken makes most recipes much more point friendly, it isn’t the heavy hitter nutritionally that salmon is. As a trained chef who has cooked for many, MANY, families with varying health needs, I can tell you, I’m a salmon pusher. Remember my tips from the Lemon Dill Salmon on how to pick good salmon! Look for a vibrant color, the more vibrant, generally the fresher the fish is. Look to see how moist the salmon looks, the fresher it is the more moist and plump it will look. Smell it. It shouldn’t smell fishy, thats a sign it isn’t fresh. Avoid salmon with any brown spots on it, that’s definitely not fresh. Avoid salmon that’s curling up at the edges, that’s a sign it isn’t moist. Add enough fat to protect the skin of the salmon, skin side down. If you want to remove the skin before roasting use parchment greased with olive oil. Grill or cook shrimp and toss with the sauce. Over grilled chicken or steak kebabs. Spiralize some zucchini and carrots in addition to spaghetti or chow mein noodles and toss with this bbq sauce. Use it as a burger topping. Lite Soy Sauce: I never use the full sodium variety, but always have this on hand. Hoisin Sauce: Like Asian BBQ sauce, sweet and smoky flavors. Sweet Chili Sauce: We love to use this as a dipping sauce for dumplings too. Rub the salmon with the canola oil. Heat a grill pan or cast iron skillet on high heat and sear on each side for 3 minutes. In a small bowl add the rest of the ingredients and mix. 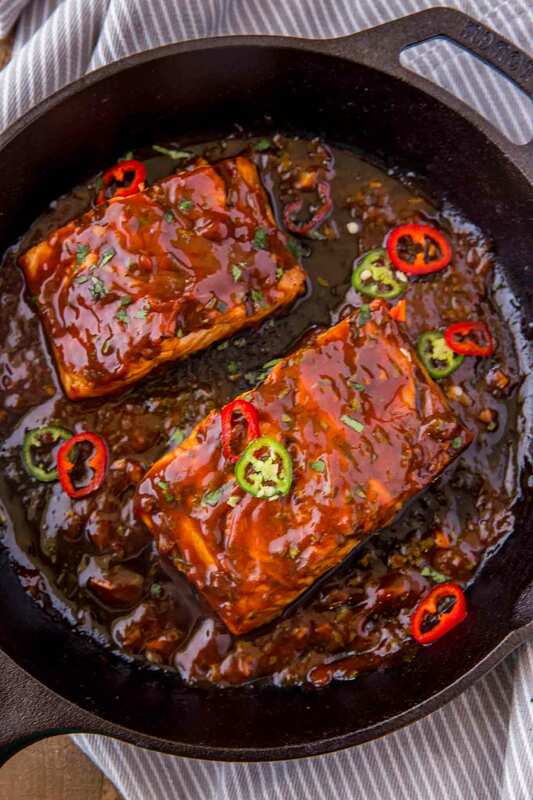 Pour the sauce around the salmon and cook for 15 seconds, then spoon over the salmon and serve. Top with hot chili peppers and cilantro if desired. Oh boy this looks fantastic. Super easy too. This with some rice would be the perfect dinner! I’m starting to get into eating salmon more and more… it’s so versatile! A dish that is sweet, spicy, AND savory sounds like a winner to me! We love salmon, so I know this will be a hit. This salmon looks incredible! Love the flavors in this dish! Drooling over this! Can’t wait to try this salmon recipe! I am loving this Thai flavor on this salmon! Such fantastic flavors! I can’t believe this is only 2 points!! Hi Rita, I calculate all my points in the recipe builder too, can you give me your point breakdown? For 6 servings I got 2 points per serving.